+ w/ JW Master of Ceremonies - Jeffrey Winston, Jazz philanthropic-herstorian or "The Big Bass Voice" Matt Gibson @ no extra charge ¿TBD/A? near you/L.A. 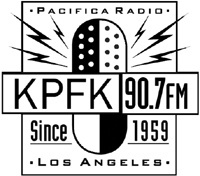 (search) "Informing Fans... Empowering Pros"
LPB: EVENTS Blog Post The Soul of L.A. "The only source dedicated to the news of Leimert Park"
(as per) Live On-Air (mention) by 2nd Mon. of the month Host, Ollie Bivins, (semi-retired) Co-Editor & writer, allaboutJazz/LA, later renamed Jazz messenger. (2:25) "After the Jazz news segment, i will be playin' somethin' special. It's a brief interview w/ some1 special who will be @ the WS, this Fri., nite. He very rarely appears in SoCal.. The interview was conducted by Mark Maxwell, the regular host of RISE. So, b sure 2 check that out." (31:37) "interview that Mark Maxwell, the regular of of RISE did w/ composer, pianist (organist) & vocalist, Doug Carn." - "O"
A weekly creative (J)azz celebration of African roots, social consciousness & spiritual transcendence.